Max Resource Corp (TSX-V:MXR) has a lot more ground to explore at its already massive Choco Precious Metals Project in Colombia, after shareholders approved a recent deal. At a meeting held on April 2, the company’s share owners voted to approve a pending deal with Noble Metals, to acquire the mining rights to a 1,050-square-kilometer land package known as the Novita Project. The arrangement also gives Max Resource the right of first refusal to the indigenous mining rights over the Novita Project, which are owned by the Novita Higher Community Council. Under details of the Feb. 2 transaction, between Max, Novo, Novo’s subsidiary, Condoto Platinum, and Sucursal, a Colombian branch of Condoto, Max will pay Noble $500,000 and issue 26.6 million shares. At the April 2 meeting, Max shareholders also resolved to approve Noble as a “control person” of the company, meaning that Noble will hold 29.2% of issued and outstanding shares. The Novita Higher Community Council receives a 12.5% net revenue return (gross proceeds from mineral sales excluding taxes and after adjustments, minus costs) from any mineral production within the Novita area. The common denominator between Max Resource and Australia’s Noble Metals is Noble founder Bill Hayden, who also co-founded Ivanhoe Mines and is a current Ivanhoe director. Hayden became interested in the potential of the Choco region, which was the largest platinum producer up to World War Two. Hayden’s Noble Metals was looking at spinning its Novita Project near Medellin into a Toronto-listed company. The property yielded a historical 605,110 ounces in exposed gold conglomerates. Other discoveries within the 1,050-square-km tenure included one historic mine that uncovered conglomerates over 3,200m by 800m, and the El Tambito shear zone, which returned three continuous channel gold assays of 71.88 grams per tonne, 63.22 g/t and 54.67 g/t over 9.8 meters, averaging an eye-popping 63.25 g/t gold. An associated grab sample returned 220 g/t gold. One year ago Hayden met with Brett Matich, a mechanical engineer with a 25-year mining career, to discuss the possibility of a deal – drawing on their considerable industry experience. Matich is now Max’s President and CEO, as well as a board director. Hayden is a veteran geologist with 38 years in mining including 20 years working in Colombia. He led the discovery of Ivanhoe’s (TSX: IVN) Platreef in South Africa – the world’s lowest-cost platinum mine – and also convinced Robert Friedland, Ivanhoe’s other founder and its current chairman, to pivot towards the Democratic Republic of the Congo, where Ivanhoe made the Kamala discovery, one of the richest copper finds on the planet (1.7 billion tonnes at 2.5% Cu). Max Resource has control over 89 mineral license applications and partial ownership of seven applications, spread over a whopping 1,757 square kilometers. This is Max’s Choco Precious Metals Project. The project is either part of, or adjacent to, the Choco Precious Metals District. Between 1906 and 1990, Colombian mining company Choco Pacific extracted 1.5 million ounces of gold and a million ounces of platinum from the district, all within 8 meters of surface. Now add to that 1,757 square kilometers, 1,050 square kilometers, (+60%) covered under the Novita agreement. The Novita land package is either within, or adjacent to, the Choco Precious Metals Project, the upshot being that Max now controls a grand total of 2,807 square kilometers of prospective gold-bearing conglomerates in the Choco region of Colombia. The company also gains a 30-man exploration camp at the town of Novita, located about 100 km from a major city, Medellin. “Shareholder approval of the Noble transaction represents a major milestone for the company. This transaction secures a major ground position in a world-class precious metals province,” said Matich, who led a small Australian iron ore junior into a $300 million merger with Mount Gibson Iron, and developed an un-drilled magnetite prospect in Canada into an 8-billion-ton compliant resource, while with Cap-Ex Ventures (TSX-V:CEV). So far this year Matich and his team have made good progress on their Choco Precious Metals Project. Max has bulk-sampled an area of historical alluvial gold mining (the conglomerate gold underneath has never been fully explored), by digging and sampling six pits (2m by 2m by 30cm-deep) spread over an 8 sq. kilometer area. The plan for the bulk sampling program is to 1) substantiate reports of free gold within the hard rock conglomerate and 2) determine the thickness of the gold conglomerate and how far it extends laterally. The company has determined that the best way to obtain the grade of the gold-bearing conglomerates is to crush the conglomerate and then process the material to recover the free gold from the sample, rather than assaying the samples. 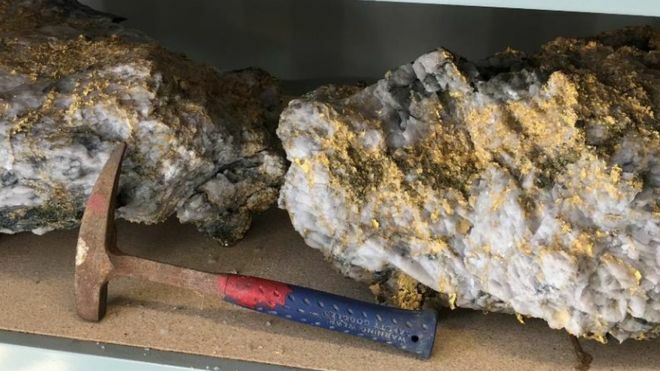 About 2,000 kilograms of hard rock conglomerate was randomly collected from each pit, then a 50-kg sample from each pit was sent to a lab in Medellin, where it was crushed to <2mm, then gravity-separated to reveal the gold. Assay results are pending. Max also dramatically increased its exploration zone – first by by upsizing it from 8 square kilometers to 36 sq km – then publishing the results of a long-wave infrared (LWIR) survey showing a correlation between the 36-sq-km area and the 1,000 square kilometers surveyed by satellite. The aim of the LWIR survey was to identify a correlation between gold-bearing conglomerate outcrops (mineralized areas at surface) and historical production in the Choco Precious Metals District.